Conveniently located off Bukit Timah Road, amidst the lush tropical greenery, it offers a perfect setting for casual leisure riding. 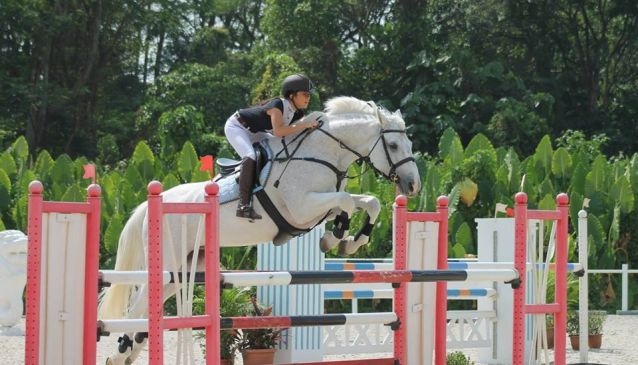 BTSC offers the widest range of equestrian facilities available in Singapore. The arenas cover over 13,000 sq. metres: the two main arenas can provide up to five dressage arenas and a separate jumping arena accommodates courses built to international standards; a third, smaller, arena is generally utilized by novice and beginner riders. Other facilities include training track, 100 stables, grass trails and roads non accessible to vehicules, rolling boxes, 12 permanent paddocks, farrier, riding lessons, a club house and a restaurant. If you're not a member, horse riding lessons are also available to the public on a pay as you go basis. Private, semi-private, group lessons but also self-riding, leasing of horse or poney, they also hold poney camps during school holidays, Pony clubs and pony rides every Sunday fromS$10.30am-1pm at S$10++ for children.